Arrival at Athens Int. Airport "El. Venizelos"
Athens Metro (subway) line 3, to Monastiraki. Frequency: every 30 minutes. Suburban train, to the Main train terminal of Athens (Larissis). Express Airport Bus connections with the Athens center on a 24-hour basis. Buses leave the airport terminal every 15 minutes. To get to the Metro and Suburban stations, go straight across the terminal exit, cross the long glass catwalk over the freeway and the station mode is just at the end of it. You can also find a taxi right outside the terminal exit, lower level. "Evangelismos" is a hospital, which has given its name to a Metro stop (blue line, ie. line 3), and is near the Hilton Hotel, and the National Gallery. 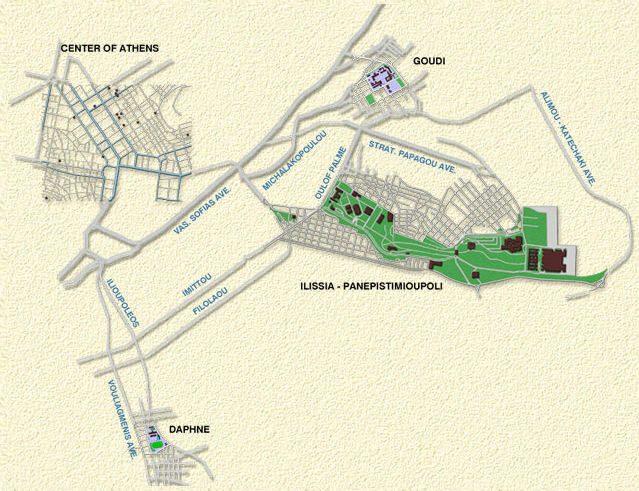 The best way is to use the Metro (subway) line 3, and get off at "Evangelismos" stop. You can get on the Airport station and get off two stops before the end (Monastiraki). Metro Timetable: 05:30-24:00. Price of Metro Ticket: 8.00 EUR from Airport or 0.70 EUR for all other urban stations in all Metro lines. E95 Syntagma - Athens Airport Express: Get off at the Hilton Bus Stop. E94 Ethniki Amyna - Athens Airport Express: Upon reaching the bus terminal, you will find the Metro terminal "Ethniki Amyna". There, you can take the Metro Line 3 (ie. blue line) "DOYKISSIS PLAKENTIAS to MONASTIRAKI " and get off at "Evangelismos" Station. Use the "Rizari Park" exit. Price of Bus Ticket: 2.90 EUR. It is a special ticket, which can be used for 24 hours from the time of its first validation, for the following: ONE trip to or from the airport, and/or an unlimited number of trips by all other public means of transport. -ONLY ONCE, if you first use it for the Express Airport Bus. -TWICE, in case you use one or more public means of transport prior to the use of an Express Airport Bus: Once, when you first use it, and once more, when you board on the Express Airport Bus. (The latter applies when one moves from the city to the airport). Buy the ticket: From the bus driver, from all the Metro stations and from all public transport ticket outlets. Taxis: the taxi stand extends from Door 4 to Door 1 at the Arrivals Level. The taxi fare from the airport to the city center is about 25 EUR, depending on the time (day or night) and the traffic load. Both "Best Western Ilissia Hotel" and "Holiday Inn Hotel" are located in Michalakopoulou street, which runs just behind the Hilton Hotel. To go to the Hilton Hotel area from "Evangelismos" Metro station, get at the right side of Vasilissis-Sofias Ave (facind the traffic lights 50m away) and walk towards the large concrete building you see across the crossroad. When you get to the Hilton Hotel building, go around it to the parking area. Hotels at Michalakopoulou street are about 5 -10 minutes of walk. If you feel like walking, you can go straight from Michalakopoulou str. towards Oulof Palme ave, where you can find the main gate of the University campus area (about 10 minutes, see map for exact location). There is a free bus there that takes you around the campus. Department of Informatics is the first one you encounter, the third stop from the gate. Bus frequency is about 20 minutes or so. Alternatively, you can use the buses passing outside the "Evangelismos" Metro station. As you get os the station and walk towards the Hilton Hotel area (see above) you stop and wait at the very last bus kiosk. Bus lines 223 and 224 runs up at "Ethnikis Antistaseos" str, in parallel of the main road inside the University campus. You get off at the 10th station, the one after the small footbal stadium (9th), cross the street, walk 100m inside the park and tennis courts and get inside the campus. Right after the tennis courts and across the campus street you are facing the buildings of the Informatics Dept. From the "Evangelismos" Metro station, Athens center is just 10-15 minutes of walk. You can go along the traffic (away from the Hilton Hotel area) and arrive at "Syntagma Square" and the Hellenic Parliament. Facing "Syntagma Square" (just in front of the Parliament) you have: 5 minutes of walk to the left along Panepistimiou ave until you meet Zappion and the National Garden, 10 minutes of walk to the right along Panepistimiou ave until you arrive at the very center of Athens in Omonia square, and 10 minutes of walk across Syntagma Square into the pedestrian zone of Ermou street inside the shopping area and very near to Monastiraki. 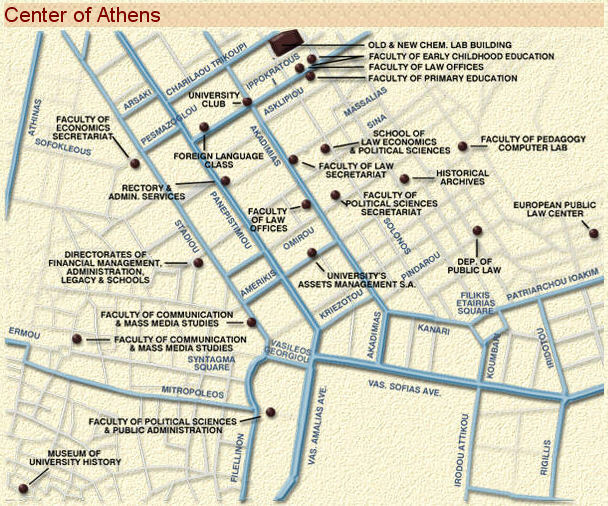 Map of main avenues and areas of the general Athens Center area.